Very ornamental with variegated leaves. Excellent taste. Adds flavor and aroma to light lagers. 4-6% bitterness. Some resistance to mildew. Zones 3 to 8. Please note that hops go completely dormant during the winter, so you will receive what looks like a pot of soil! Used to add flavor and aroma to pale ales and other types of beer. 8-11% bitterness. Resistant to disease and fungus. Zones 3 to 8. 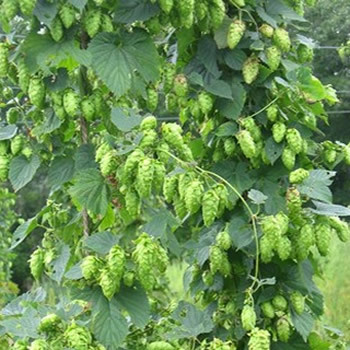 Please note that hops go completely dormant during the winter, so you will receive what looks like a pot of soil!